You can start using DroidCam via the various methods described here. First, start the client app on your PC. You’ll find a shortcut to DroidCam Client under Start Menu, and on your Desktop. If there is a separate admin account on the system, these shortcuts will be created on that users Desktop/Start Menu during installation. If you can’t find any shortcuts, “DroidCamApp.exe” is in the installation folder: C -> Program Files or Program Files (x86) -> DroidCam . 1. Turn on WiFi on your phone and connect to your home (or work/school) network as you normally would. You should be able to access web pages via the browser app. 2. Start the phone app. It should show the Wifi name, and IP & Port information. If the IP is all zeros (0.0.0.0) – you are not properly connected to a WiFi network. 3. On the PC client, make sure the connection method is “WiFi/LAN”. Enter the IP and Port as displayed on the phone. Click [start]. 4. The phone app should start showing the camera output. The PC client should start updating the “webcam” output – you can check in Skype/etc. Find “webcam” or “video” settings in the options/preferences of these programs. 5. Use the [stop] button to disconnect. Connect your device to the computer with the USB cable, then use the USB option on the PC client and click [Start]. The client will try to detect the device and establish a connection. If it works, great, you can stop reading now. USB connections are possible via a program called “Android Debug Bridge”, or ADB. A copy of adb.exe is included in the DroidCam installation folder. You can search on Google for info on ADB in Android. 1. Disconnect device from computer. 2. Install drivers for your device on computer. Option 2: Device specific driver: http://developer.android.com/tools/extras/oem-usb.html#Drivers. 3. Go to Settings -> Developer Options, and enable “USB Debugging” on the device. On Android 4.2 and higher, the Developer options screen is hidden by default. To make it visible, go to Settings > About phone and tap “Build number” 7 times. Return to the previous screen to find “Developer options” at the bottom. 4. Plug the device back into computer over USB. If you get a dialog asking “Allow USB Debugging”, you need to tap OK. Sometime you need to open “USB Options” from the notification area on the device and pick “PTP” mode for that to show up. Your computer will now detect the phone as a new usb device and associate it with the drivers installed in step 2. This should make DroidCam work. (1) Open Task Manager, and end the “adb.exe” process. 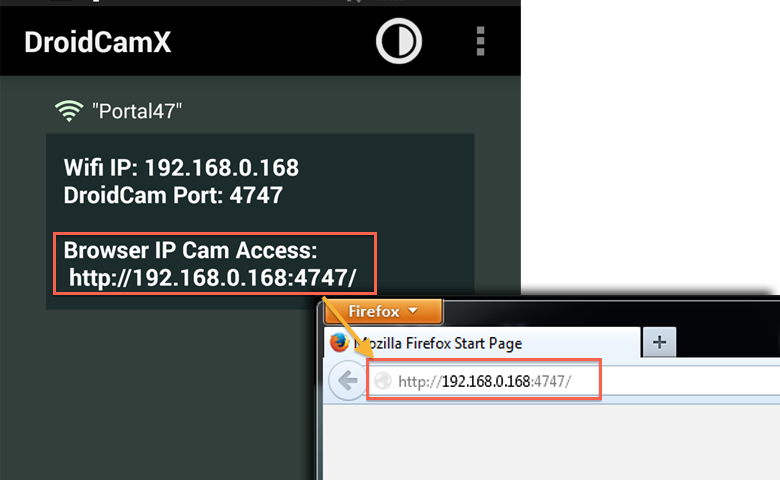 If that doesnt help, try also changing the ‘DroidCam Port’ setting in the app, and on the client. Use, for example, 4848, 5050, 5151, etc. (1) Turn “USB Debugging” option from step 3, OFF then ON. (2) Open Task Manager, and end the “adb.exe” process. If your computer has both USB-2.0 and USB-3.0 ports, use USB-2. Finally, if USB is still not working or you are seeing errors with adb.exe, you can try this alternative setup tool instead. To use the “IP Cam” feature you normally don’t need to install any extra software on the computer. 1. Turn on WiFi on your phone and connect to a WiFi network as you normally would. 2. The app will show Wifi network name, and IP & Port information. If the IP is all zeros (0.0.0.0) – you are not properly connected to a network. 3. Open your internet browser (Firefox, Chrome, etc), and enter http://ip:port into the address bar (replace these with the actual ip and port values from the app). This should open a web page with the camera feed embedded inside. Tip: Use an MJPEG viewer app or program to access the raw feed via http://ip:port/mjpegfeed (eg. on a Tablet, another smartphone, or a media player such as VLC). Instead of connecting to the phone app from the PC client, DroidCamX can connect to the PC client from the phone. 1. Use the “WiFi Server” option on the PC client. Click [Start] to wait for a connection. 3. 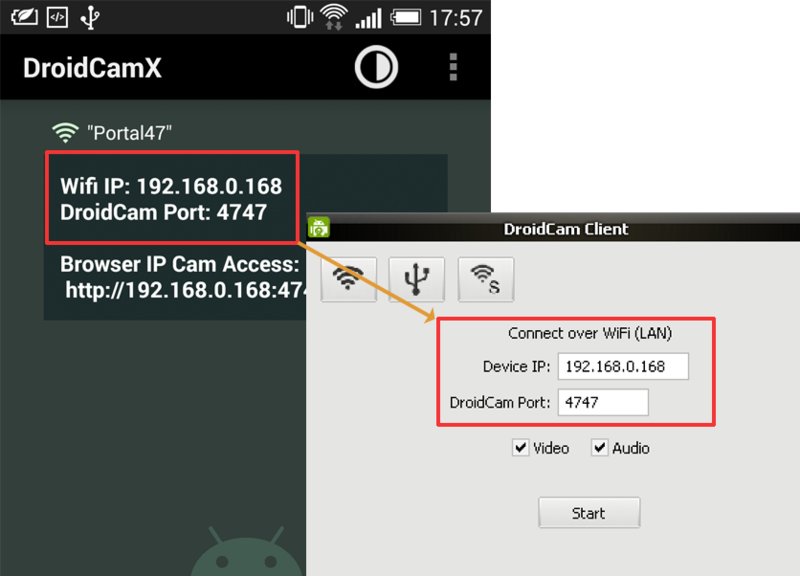 Start DroidCamX, use the options menu and choose “Connect to Server”. You will need the computers local IP address (192.168…), look in your network settings. You can also port forward 4747 to the computer in your router, and connect to your external IP over 3G/4G/LTE. Check online about how “Port Forwarding” works for more info. Type in “my ip” into Google to get your external IP*. And be careful with data plan limits! *assuming your ISP gives a dedicated IP, which most do.